NOTE: New instructions are available to change the login screen background image within OS X Mavericks. 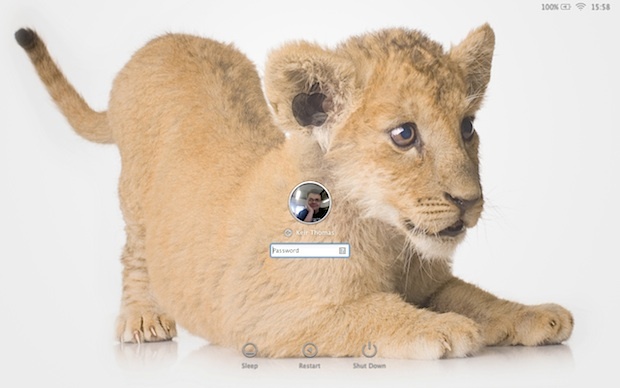 Please refer to those if you are looking to customize the login wallpaper in the latest versions of OS X.
Here’s how to change the wallpaper that lies behind the standard login screen on OS X Lion & Mountain Lion (although not the login background you see if you have FileVault enabled, which cannot be altered). As such, this tweak is not for the fainthearted because it involves editing system files and will therefore affect all users of the system. Previous tips here at OSXDaily have explained how to change the login screen background in prior versions of OS X, but OS X Lion and OS X Mountain Lion changed everything (again). As with the Mission Control and Dashboard wallpapers, the login screen wallpaper is actually a pattern that’s repeated from left to right, top to bottom. You can replace it with a similar pattern of the same size (256 x 256 pixels) or use a full-size image the exact same resolution as your monitor. Note that because the white text and graphics of the login screen are overlaid on the wallpaper, darker wallpapers tend to work better than light ones. Open the image you’d like to use for the wallpaper in Preview and convert it to PNG format by clicking File -> Export. In the dialog box that appears, select PNG from the Format dropdown list and change the filename so it reads “NSTexturedFullScreenBackgroundColor.png”. Now copy the “NSTexturedFullScreenBackgroundColor.png” file to a safe backup location. Then click and drag your new image onto the Finder window so it overwrites the original. You’ll be asked to authenticate, so click the button in the dialog box that appears and type your login password when prompted. Choose to replace the original file when prompted. That’s all that’s required, but you’ll have to reboot your computer for the change to take effect. If you find the wallpaper pattern shrunk and repeated across the login screen rather than filling it, try using an image editor to create a new image of the same resolution as your screen (that is, 1280 x 800, for example), and then open your wallpaper image before copying and pasting it into the new image. Then save out the new image to the location mentioned earlier using the filename that’s mentioned. And drop your backup “NSTexturedFullScreenBackgroundColor.png” image back in place. This is another tip from Keir Thomas, author of Mac Kung Fu, a new book with over 300 tips, tricks, hints and hacks for Mac OS X Lion. It’s available from Amazon , and also in eBook form for all eReader devices, including Kindle. Where can I find this background image with the baby lion?? Notice the image is flipped and edited in this guys background. The image here is the original. Or you can just use a nice little App called Lion Designer, and save yourself the technical hassle. It works! Get your screen resolution from Displays control panel and resize an image to exactly that. And where can we find this baby?!!! Please, where can we get a copy of that cute baby lion? Also, we need to find a way to do this with out having to have the resolution of the image match that of the display. If you are only doing one computer, it is no big deal, but if you are doing hundreds or thousands for a school or large company, you don’t want to have to change the image for every screen size, or different monitor that might be connected. Hello..Where can I find this background image with the baby lion,please? I had issues with the images repeating even though it’s the same resolution as my MBP. A little more research and I found out that the image needs to be 72dpi. For Photoshop users open the image then save it using the web settings and set to PNG-24. It will then convert your image to 72dpi but keep the size. Worked really well after that. Use Loginox app! Works for 10.7.4 as well. This did not work for me i dont know if is because am on OSX 10.7.4 but i followed your guide to a Tee.. This guide doesn´t work for OSX 10.7.4. Use the app Loginox |FREE| and rename the png to NSTexturedFullScreenBackgroundColor.png before drop it into the apps window if u have 10.7.4. Or you could just download Onyx–a really handy, free maintenance utility that conveniently uncovers some of the Lion’s mysteries. Here’s a link to CNet’s download page. And it looks like they featured an article not but a few days ago. . Onyx provides the user with a couple dozen maintenance/convenience functions. Don’t be intimidated by the fact that some of these processes are rather complicated, in fact I would encourage anyone to take an hour or two and learn about some of the primary maintenance features. You will be a happier person and your Mac will love you for it! Anyhow, one of the most basic functions is the Login Background Image, and that’s not the only thing you can alter on the login page. Hope this helps! Great tutorial! It works like a charm. Now I have my favorite singer on login, Angela Gossow. hey it don’t work wad should i do? this doesn’t work after the 10.7.4 update. Download Loginox and it simplifies the whole thing. It can even get rid of the Apple logo if you want. How do you get rid of the hazy overlay? The colors aren’t as sharp the original picture as a result. I can’t seem to find a way to get this to work on Mountain Lion, as Loginox is incompatible, and altering the file does nothing. Any ideas? I followed the steps precisely. No change. Who is the system finding the old file that is now not even in the System directory tree? I meant “How” is the system finding it. If that original pattern image file is now totally missing, how is it still filling the screen? Obviously, there is a second grey burlap pattern file in the system… but where? I have tried to change the login screen wallpaper like the instruction, but I see no change at all, I have tried to resize my image same as display resolution then I change the picture format to png … but that’s not going to change at all…… Please help, any suggestions? Hoi folks I am running into a problem and hope sb. can help me out. I did all the above mentioned, resized my pic to Display resolution + 72ppi and saved it as .png, replaced orig file with new one and gave it the exact same name. Though after a restart nothing changes there is still the same grey linen bg o_O !?! ?